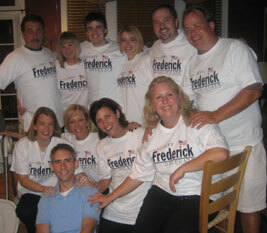 Delegate Jeff Frederick has provided independent, effective leadership for the 52nd District. When you elected and re-elected Jeff to represent you in the House of Delegates, he promised to be a strong voice for our priorities and our quality way of life. He promised that he would fight transportation solutions, responsible growth, better schools, and lower taxes. Jeff has kept his promises to the people of the 52nd District. He will continue to work day and night to represent our values and priorities in Richmond. Transportation dollars should go to transportation. We need to lock-up the transportation trust fund, and make roads, rail, and transit a priority in the state budget. Finally, Northern Virginia needs to get back more than 27 cents on each transportation dollar it sends to Richmond. Jeff Frederick believes our children deserve the highest quality education so that every child will have the tools to become anything they dream. 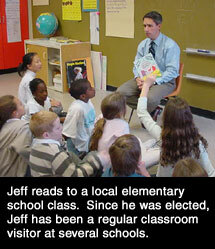 As your Delegate, Jeff has proven that education is a top priority. That’s why he’s worked closely with the state’s educators by holding a successful Teacher’s Summit. In serving on the House Committee on Education, Jeff believes it is important to hear directly from educators on the challenges they face. To aid in doing so, he created an Education Advisory Committee for our District – the only legislator in Virginia to have done so. Jeff feels it is important to stay on top of the SOLs (Standards of Learning) to make certain they are working to improve accountability in our schools without putting an undue burden on our children, and he is the first member of the General Assembly to visit the Department of Education and actually take the SOLs, giving him first-hand knowledge of the tests. Finally, in his continued efforts to gain insight into our schools, he has volunteered in our public schools as a teacher's aide. Jeff Frederick has a detailed plan to get skyrocketing property taxes under control. Jeff Frederick supports internet safety legislation that would empower parents and keep offensive material away from our children. Moved by the plight of a local family with a critically ill child, Jeff sponsored legislation to increase Virginia’s newborn screening program from only nine diseases to over thirty diseases, bringing Virginia law in line with other states. 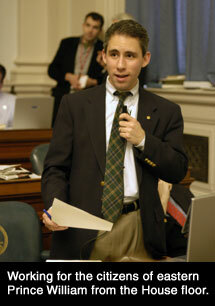 As of March 2007, this legislation has already saved 33 lives. Jeff has worked closely with fellow Republicans as well as Democrats to break through the political stereotypes, and work to better the lives of those he represents. And it's made a difference. Many of the bills he has sponsored throughout his two terms have been signed into law by Governors Warner and Kaine, including the most significant land-use (growth/development) reform passed and enacted into law in 2006 -- a law that has successfully halted the construction of 37,000 new homes in Northern Virginia. In 2007, he sponsored legislation that provides impact fee authority to local government to better manage and control growth/development. Jeff also sponsored Virginia's first ever back-to-school sales tax holiday that many families are now taking advantage of each August, and he co-sponsored legislation to eliminate the state sales tax on groceries. His Community College Transfer Grant legislation will help make a 4-year college education more affordable. As Vice-Chairman of the Virginia Small Business Commission, in 2005 Jeff sponsored legislation to create small business health insurance pooling, which is making quality health care more accessible and affordable to our citizens, and he's worked to clean-up the Chesapeake Bay and is working to get Potomac Landfill in Dumfries on the road to closing down. Jeff has also pushed for a comprehensive strategy to address our transportation challenges, including making Northern Virginia a priority in the state budget by targeting any new transportation dollars to the areas that need them the most, instead of simply asking our citizens to pay more while shifting 70% of those funds downstate. In his first term, Jeff increased state funding to his district more than any other freshman legislator in his class, and he was elected to two legislative leadership positions. Since Jeff took office, there have been significant increases in transportation funding for eastern Prince William. When taxes are high, taxpayer priorities aren’t funded, and when the state budget is bloated, the economy suffers. Jeff Frederick is dedicated to ensuring that Virginia government provides an atmosphere where businesses—both large and small—thrive, and the working families of Virginia are able to build something for their futures and their children’s future. That’s why he’ll never stop fighting for lower taxes, better schools, improved traffic, controlled growth, and a smaller, more efficient state government that works for you – not the bureaucrats and politicians. When Jeff Frederick was elected to represent you four years ago, he promised to hold regular town-hall meetings in order to stay in touch with his constituents. And he’s done just that—he has also set up mobile offices to hear constituents concerns on weekends coming to your neighborhoods. Those that know Jeff know him as an energetic hard worker. He will continue that work ethic in Richmond, working hard for us. Jeff Frederick means independent leadership for Virginia. He is the right leader for our community, for our families, and for our future. 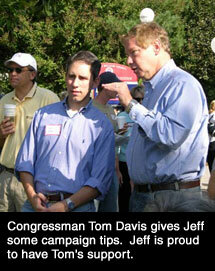 Click here to read more in an interview with Jeff by the Potomac News. State law allows the acceptance of both personal and corporate contributions in any amount.